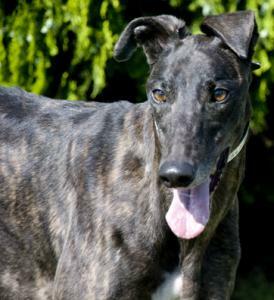 Jackie is a 66lb, shiny, black-brindle female that was a trainer favorite at the track in Sanford Orlando. She also raced at Tri-State in West Virginia and Birmingham Alabama. She has 134 races listed. She turned 4 on April 11th. Her sire is the very famous Kiowa Sweet Trey and her dam is Tapped Out Tony. She is described as being a very friendly, playful girl that can be a little stubborn. She is a hugger that tried to give hugs to every person she met at the vet's office. She is gorgeous and has a lot of personality too, we can see why she was a favorite with her trainer at the track. She loves cuddles, marshmallows, milk bones, belly rubs and loves to play according to her trainer. She has been living in a foster home with a tiny bossy female dog and does fine. She passed her cat test easily. She is a smart girl that figured out how to get out of a metal crate pretty fast. She will need a plastic vari kennel that the airlines use since she is a bit of a houdini. She has done well with the kids she has met including a crying baby and just seems to love everyone.